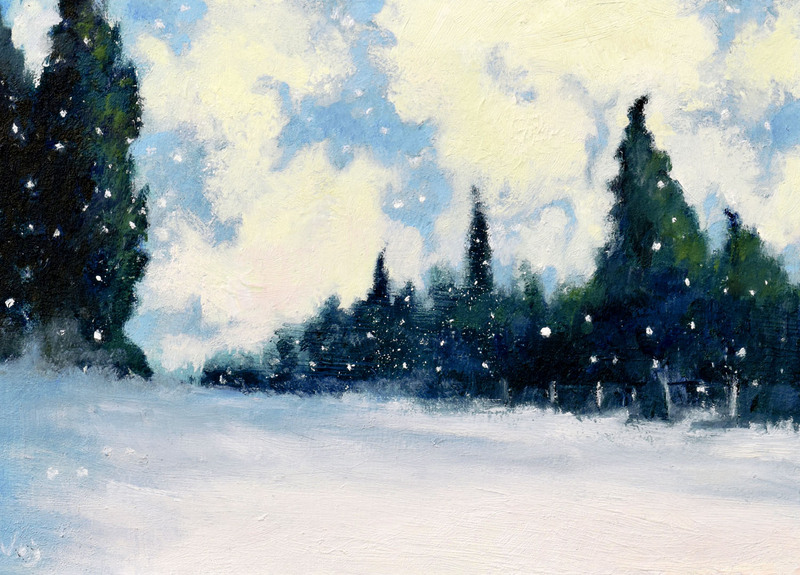 This magical landscape started from a memory of a walk in the snow among cypresses while snowflakes floated down and stood out against the dark green trees. I was going to call the painting ‘The Dance’ because the way all the elements moved triggered the memory. The first movement is a lento tempo: snowflakes float down to the breeze’s rhythm in front of us. In the crisp blue sky, the arabesques of clouds laden with snow folding and swirling across, shift the tempo to a slow and stately adagio. While on the ground, the tall, slim cypresses sway in the freezing breeze to a tempo allegro. Different moves for different shapes. Different colours for different moods. The invisible conductor’s lead creates a beautiful melody. Have I managed to capture the rhythms of nature? Another lovely snowy winter scene John and it made me think; often in the snow we experience a sense of quiet, muffled stillness which can evoke a feeling of calm and peace which is especially appealing to us at Christmas but there can be a lot of movement around us on such a day. If we stop to savour the quiet it can heighten our awareness of the scudding, swirling clouds and the swaying, shifting trees amidst the ‘dancing’ snowflakes before our eyes. So yes, you have captured the rhythmns of nature as well as the rhythm in colour and form. I does seem it’s the time of year for those muffled quiet snowy landscapes, perhaps a counterpoint to those frenetic Christmas activities. Thank you for your comment on the painting, glad to hear it captures the rhythms of nature.